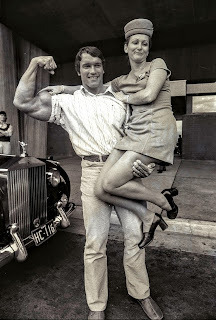 No June Gloom for Arnold as the King of Kings, Lord of Lords is still a historical and media force to be reckoned with. Breakthrough sci-fi action thriller Total Recall celebrated it's 25th anniversary this past Monday, reminding us that Paul Verhoeven is a mad cinematic genius and that the Colin Farrell remake was laaaaame! The Oak hit Rio for the Arnold Classic Brazil where over 25 competitions in martial arts, power lifting, bodybuilding, chess and pole dancing(?!) took place. Terminator: Genisys promotion is in full swing with billboards around town and TV spots aplenty. Original creator James Cameron lent his support to the new endeavor and told Arnold he loved the flick. The original B-movie, Tech-Noir masterpiece will be playing nationwide as part of Cinemark's Fathom Events starting on June 14th. If that's not enough Arnold for you, and it better frigging not be, you can catch classics Predator and Kindergarten Cop (and tons of other summer classics) via The Arclight Cinemas and of course, as his first iconic role in Conan the Barbarian and Destroyer with me and special guests at The Egyptian Theatre on Saturday, June 27th.